It's time to stop the politics of passivity and ask some difficult questions about the SNP and independence. 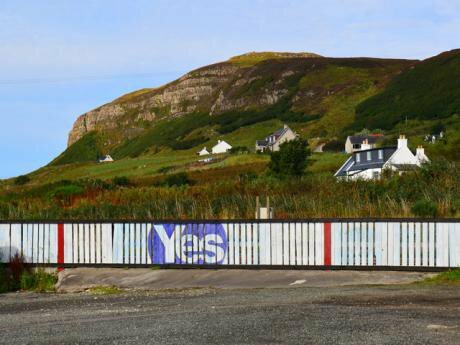 Image: Pro-independence sign in Uig. Geograph.org.uk, Creative Commons. ‘What Do You Do When A Society Lies to Itself?’ asked writer Umair Haque this week in the context of the constitutional standoff in Trump’s America. But it is true of most nations most of the time; certainly it is true of today’s UK - and of modern Scotland. Scottish politics are currently in a phoney war - a becalmed period of inertia and inactivity in-between the storms that buffet politics. Everyone is waiting to see how Brexit pans out. This is central to how the SNP and Scottish Government see things. They are sitting, anticipating the debris that flows from Brexit and the implications for independence. Unfortunately, this is a politics of passivity, and even of acceptance, that others (the UK Government, EU negotiators) will determine the political environment. Added to this, since the indyref, a problematic mix of complacency, and even self-deception, has befallen too many independence supporters. For example, the SNP leadership has failed to grasp the political momentum post-2014. Nicola Sturgeon has not made one strategic gambit since the indyref and her election as SNP leader and First Minister - beyond her March 2017 attempt to advance a second indy referendum, in which she was out-manoeuvred by Theresa May and the UK Government. Scotland’s referendum was a great moment in our politics - a democratic explosion, an expression of the democratic intellect, and a mass exercise in political education the like of which our country has never previously seen. It is unfortunate then that some SNP and indy supporters seem to regard this as a one-off, as if this political mobilisation and education was the zenith - rather than a continuous exercise that never ends, questioning and challenging all orthodoxies. Too much time since 2014 has been spent telling comforting stories. These include that the 45% of the indyref is only a base camp of support and that the only way is up in any future campaign. But there is no iron law of electoral support for any cause – independence included. Then there are the glaring omissions: the absence in public and private of any proper post-mortem on why Yes lost, and the failure to put together a new improved independence prospectus. And with all these missing elements the SNP Growth Commission, headed up by Andrew Wilson, has come to be seen as the answer to some of the main strategic concerns – namely, currency, growth and economic concerns. However it cannot address the bigger questions about independence, because that wasn’t in its remit – while the politics of everything remain beyond it. If independence is the answer, what is the question? All of this has conspicuously avoided the big strategic question - what is independence the answer to? For some, this question has an obvious answer: independence is an end in itself to be a sovereign nation. But that is the response of Nationalist Scotland (whether in or out of the SNP) and does not address how the majority of Scots who don’t see the world in these terms are motivated to sign up to the cause. The answer from non-Nationalist Scotland for independence has increasingly shown itself as threadbare. Thus, Pat Kane recently invoked - as many have - the vision of a ‘Nordic social democracy’ as within reach through independence: deliberately ignoring that Scotland cannot be fully Nordic (the inconvenience of geography, history and tradition to name but the most obvious), and that everywhere in the world social democracy has been in retreat for decades - hollowed out, compromised and discredited. Underneath this, one version of an indy Scotland of the future is changing to resist change. In a reply to an Andrew Tickell piece in ‘The National’ last week one person stated that ‘The case for independence is not a case for radical change but a case for preservation of what we have, a social democracy. Radical change comes from Westminster and is almost always unwelcome.’ Independence as preserving what we have, the politics of the status quo, isn’t exactly highly imaginative or even real social democracy. Instead, it is the politics of kidding ourselves, linked into the time-honoured Scottish tradition of pretending to be radical to describe what is ultimately a conservative, conserving state of affairs. We have been here many times before in our history and politics. Independence must be for something bigger and bolder, with a clear vision, if it is to cut through, to tell an engaging story, and to speak beyond true believers. The 2014 offer managed to have a populist edge, while speaking to a social democratic sentiment which sat with an acceptance of neo-liberal assumptions. Such a mixture isn’t permanently on offer to the independence cause: there is Corbyn, Carillion, and the collapse of the neo-liberal model, while incumbents cannot continually present themselves as populists. One of the most hopeful aspects of the 2014 indy offer was that it seemed to offer the chance of not just a separate Scottish state, but a different kind of state: one more attuned to the modern age, democratic, pooling sovereignty and sharing it domestically and internationally, with a sense it was the servant not the master of the people. However, since that historic vote, the landmark of ten years of SNP Government has passed, and such a length of time allows us to review their track record, policies and actions. While the SNP Government has done many decent things, with a track record of competence, there has also been a conspicuous absence of any real radicalism or innovation in policy. Nowhere has there been any substantive progress on fleshing out and making real the politics, structures and ethos of a different kind of Scottish state, and the statecraft that would flow from that. Instead, the politics of imagining a different kind of state – and indeed a different kind of society and future – have been (however imperfectly) captured by the advent of the Corbyn Labour Party. That whole project may well end in tears, particularly if a Corbynised party were to find itself in UK office, but that’s a whole other argument. Ten years in office tells us many things. It points to the SNP leadership being informed by a technocratic managerialism – the outlook that informed the list of achievements in the recent SNP party political broadcast. But what it also points to is caution and conservatism, and that this is a party without any clear sense of transforming Scotland beyond the issue of independence. Again, that is all that matters to some - the party and a large section of the indy base - but it doesn’t create a winning majority, tell a compelling story, or paint the politics of the future. There are also tensions between the appeal of party and that of movement – a universal set of faultlines. The SNP is a party, not a movement. Yet it claims to speak for and represent a movement. The period 2011-14 saw the creation of a genuine independent pro-indy movement but that has now dissipated – in part incorporated into the SNP, or one that has just disengaged and disappeared into the ether. This poses problems for any future politics and independence offer. How do people seriously imagine another indyref will come about and be won? The answer at the moment centres on the appeal and decisions of the SNP and its leadership, and the electoral prospects of the party. That is of course unavoidable from where we currently are, but it is not a healthy place to be because all parties go up and down, and the notion that the SNP could in perpetuity defy the laws of political gravity was always misplaced. It isn’t an accident that the SNP have been proprietorial about the indy cause. They are a political party. But in the ten years of office they have shown a mixture of suspicion and dislike to many political initiatives which aren’t from the party or party controlled. Thus, such independent initiatives as RISE and Common Weal are viewed by senior SNP personnel as proving the ill-advised nature of projects which don’t come from the party and thus prove their self-perpetuating dictum that the party always knows best. Unfortunately this leaves the SNP and its current stance increasing isolated and vulnerable. A politics solely based on party carries problems. It has limitations in its appeal, its rationale and resources. It is (for obvious reasons) partisan, more short-term than strategic, and less interested in ideas. The problem is these areas of weakness are all key to making the case for independence and building an infrastructure, community and argument around it. All over Scotland there is a listlessness, inertia and anxiety. People feel they are treading water with a sense that decisions and power sit elsewhere. This sense of powerlessness has been aided by the missteps of the SNP since 2014, and the current stance of the party, which has failed to seize the political initiative since the energies of the indyref. The SNP leadership thought post-2014 that they had somehow caught and were the beneficiaries of a historic wave of change: the tartan tsunami of 2015 being one expression of it. They didn’t quite know what this wave was, what had produced it and where it was ultimately going, but they thought they could ride it and shape our collective future. Inevitably, that period of our politics has now firmly ended and we are in a very different political environment. The current approach of the SNP will not deliver the change some still hope for. It will not create in the immediate future a political sentiment and public opinion where an indy referendum is winnable in the next year or two. Nor will a politics of caution, command and control and centralisation suddenly change how it operates, morph into something else and rejuvenate into a politics of pluralism and co-operation. It is understandable that Nicola Sturgeon hasn’t taken a future indy referendum officially off the table. Not only does it work as a discipline on SNP and indy supporters; critically it acts as a hypothetical big stick towards the UK Government in relation to Brexit. Yet, what the SNP leadership has failed to point out is that there is next to no chance of an indy referendum in 2019 or indeed before 2021 (and before the next Scottish elections). That is in part a product of political decisions made since 2014, the consequences of the SNP losing their Scottish Parliament majority in 2016, and the ill-fated moves by Sturgeon in 2017 towards a second referendum. A lot of political capital and authority has been burned through in these decisions that cannot be ignored. None of us have all the answers to Scotland’s politics, the state of independence, and the future challenges. But fundamentally we should not put our heads in the sands and believe that everything is alright, or will turn out alright, unless there is a discussion of where we are - and that things need to change. That such observations should even be seen as heretical or the sort of things which shouldn’t be admitted or said in public, only confirms the scale and depth of the crisis. Things need to change urgently, otherwise – as is already happening – that mantle of change will be seized and adopted by others.